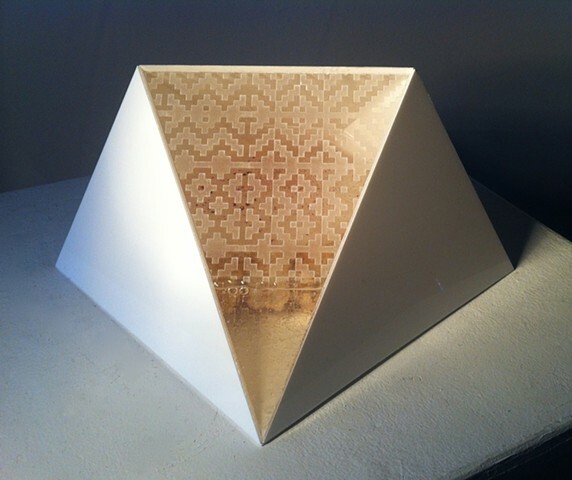 Laser-etched weaving draft (sampler) pattern on Plexiglas, constructed into half dodecahedron 'reliquary' with the assistance of Alexandra Lemus Rodriguez and Antoliano Nieto, mock ossified form (Mock Ossification III) in gel wax secured inside. QR code laser etched to the underside of the object, leading to The Ossificatorium interactive website featuring constructed bio-based narrative (fictitious osteobiography). Abandoned on statue of Jean Drapeau, Vieux Montreal. Never found, object still missing, interaction with object reported by one person via anonymous online poll on the Ossificatorium website, who selected the answer "I saw this object and left it where it was, untouched."